Dubai: Bulls and bears are slogging it out in US equities trying to push the gauge in their favour, but this instead may push them sideways. Factors such as a dovish Federal Reserve, which expects not to hike rates this year and increase it once in 2020, and progress on talks between US and China have been supportive of US equities, but if earnings fail to meet expectations when results start to come out, it could weigh on equity markets. “While lower rates and dovish stance by Fed is positive for US equities, the first quarter EPS estimates cut would cap the upside. 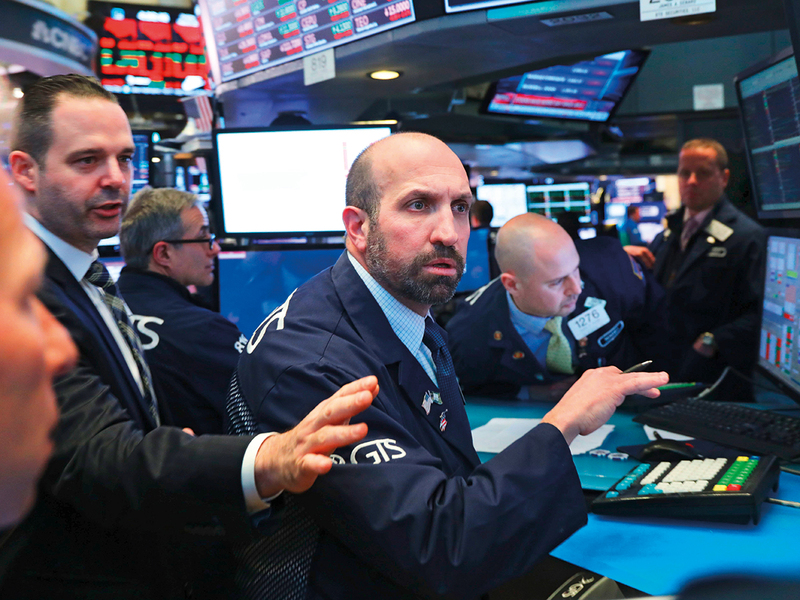 The S&P 500 would trade in 2,600-2,900, range with 2,600-2,650 levels providing near term support,” Phaneendar Bhavaraju, Managing Partner & Head — Global Market Strategy at Arrow Capital told Gulf News. The Dow Jones Industrial Average gained more than 200 points on Friday, bringing the weekly gain to 1.5 per cent. The gauge has gained 11 per cent in the first quarter. The S&P 500 index closed Friday’s session with 0.67 per cent gains, taking the total weekly gains to 1.2 per cent. The gauge has gained 13.1 per cent, the best quarterly performance since the third quarter of 2009. The dollar index is expected to weaken after gaining in the last week. “Would this mean that the US currency will gain more? We don’t think so, we regard this recovery as transient and we expect Treasury yields to continue pushing lower in the medium term, which will be a headwind for the US currency,” Konstantinos Anthis, Head of Research at ADSS said. The dollar index gained 0.58 per cent in the past week, after gaining 0.84 per cent in the past three months. “Low interest rates won’t help the dollar either. The index would top out at 97.8-98 levels and should decline 4-5 per cent from there,” Bhavaraju said. Gold would suffer as well despite a weaker dollar, which makes the alternative asset such as the yellow metal attractive. “We don’t see significant gains beyond $1,350 as weak global growth will cap inflation,” Bhavraju said. Gold registered gains of 1.2 per cent gain for the quarter, helped mainly by a dovish US Federal Reserve and concerns about the global economy. “While it might be too early to talk up the prospects of a bottom for gold, it is worth noting that the precious metal has now reached a key technical area around $1290, the base of its previous breakout. It needs to reclaim that $1,300/$1,305 area first to repair some technical damage. However, more pain could be on the way should the most recent low $1,281 gives way now.” Fawad Razaqzada, Technical Analyst, FOREX.com said.